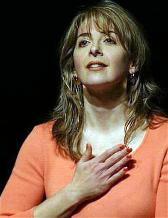 Karen, an original member of the PCW, is a talented actor, writer and director. She is a member of SAG, AEA and the Dramatists Guild. Her one-woman show, Love Arm’d, Aphra Behn & Her Pen, has toured internationally for 12 years to more than 135 cities. Love Arm’d was performed at the Bedlam Theatre as part of the Edinburgh Fringe Festival in Scotland and has received grants from the Louisiana Endowment for the Humanities, the Juliet Hardtner Endowment for Women in the Arts, NYSCA’s Decentralization Program and the National Endowment for the Humanities. Her new play, Cheer from Chawton: A Jane Austen Family Theatrical has been performed at the renowned Players Club in New York City and the Mission Theatre in Bath, England for the Jane Austen Festival followed by a separate run in repertory of both plays again at the Mission Theatre in Bath. New York City Credits include: LM Macy’s Innocent Diversions at Theater 1010; Madwoman of Chaillot at MTB Studio; Andrea Lepcio’s Looking for the Pony at Strawberry and Sam French Festival; Life’s Call at New York International Fringe Festival; The (low life) Cherry Orchard, at Chekhov Now Festival; Innocent Diversions at the Trilogy Theatre. Regional credits: Miss Havisham in Great Expectations at Indiana Repertory Theatre;The Rover and The Cherry Orchard at Resident Acting Company, Cornell University. All’s Well That Ends Well at The Shakespeare Theatre in Washington, D.C. directed by Michael Kahn; The Three Sisters and Summer and Smoke directed by Paul Giovanni. Film: Modern Love directed by Robby Benson. Directing credits: Stray Cats by Tom Matthew Wolfe for Blue Roses at Manhattan Theatre Source Playground Development Series, Romeo and Juliet and She Stoops to Conquer, Bergen Community College. Writing Credits: Pumpkin Fluff, was honored with readings at the Blue Roses Infusion Series, the Professional Creative Workshop and in the Play Lab at the Last Frontier Theatre Conference in Valdez, Alaska. Interalia and X1 at Blue Roses Infusion Series and scenes from Where Art is Framed at the Professional Creative Workshop. Karen holds a BA in Theatre, University of Akron and an MFA in Acting, University of South Carolina. She has also studied at the National Theatre of Great Britain and at The Shakespeare Theatre in Washington, DC.